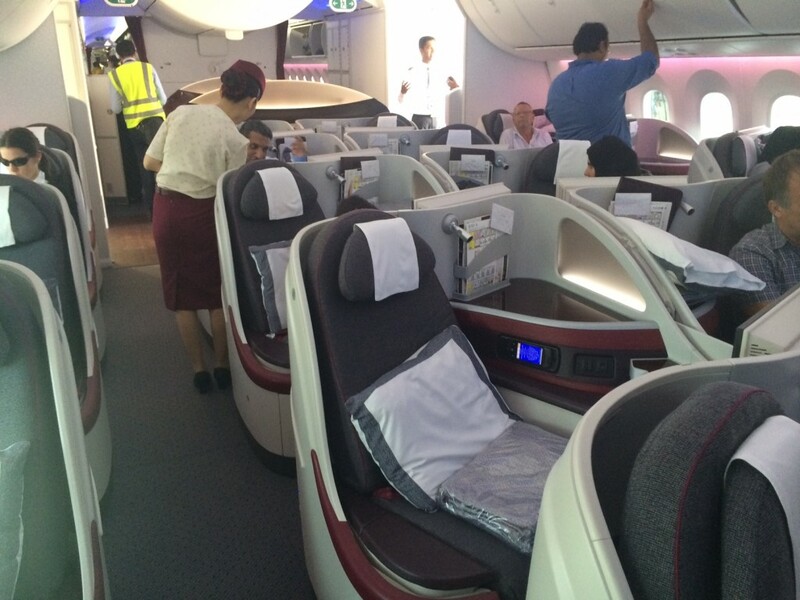 This is my review of Qatar Airways business class on the Boeing 787 Dreamliner. I apologise for the slight delay in getting this final article onto the site. I had a very small time window between returning from Doha and heading off on holiday over half-term and I couldn’t get this last piece finished in time. There is one more related article still to come. Having flown Qatar Airways, Emirates and British Airways in business class in the last four weeks, I am going to run a Great Airline Cook Off next week to compare the food offerings! 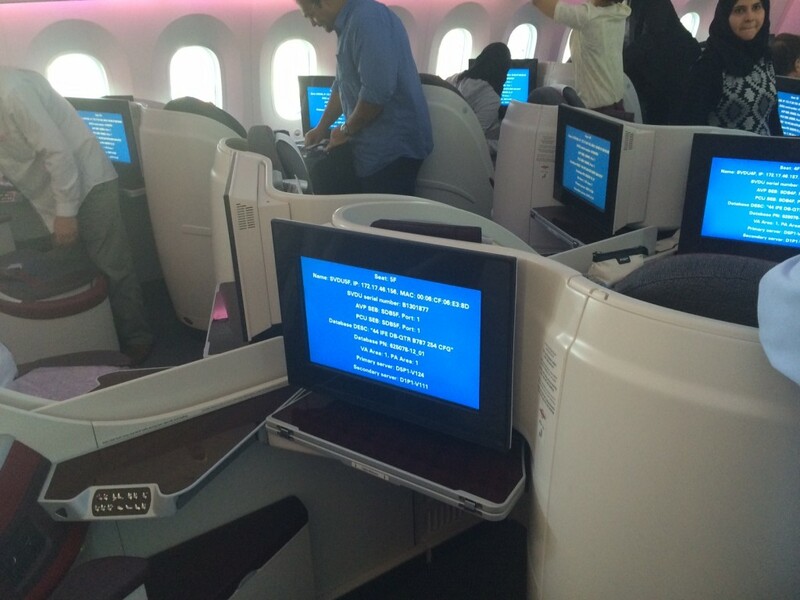 Today I am reviewing my Boeing 787 Dreamliner Qatar Airways flight from Doha to Zurich. 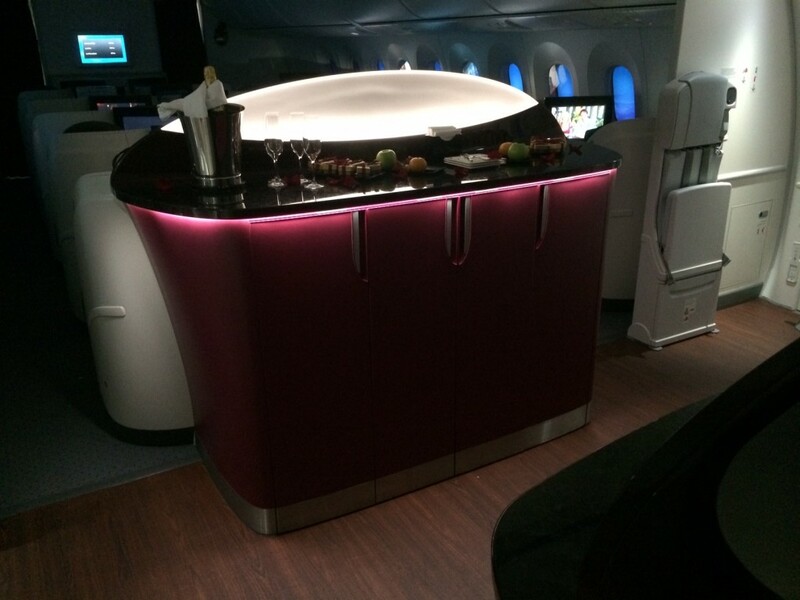 I discussed the variety of aircraft flown by Qatar in my review of the 777 flight. There is a mix of A330, A340, B777, B787, A319 (in an all-business formation) and, as of last month, A380 aircraft in the fleet. Due to delays in receiving the A380s there were a lot of aircraft changes going on. The reason I flew back to Zurich is that my original B787 flight to London had been switched to another B777 a few weeks earlier and I wanted to experience their latest product. 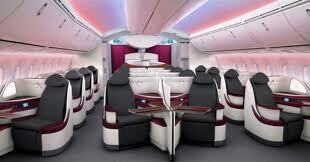 There is no First Class on the Qatar Boeing 787 fleet and, as you will see, it really is not necessary. The business class seat and food is very close to the First Class product offered by many airlines. The new A380 aircraft slowly coming into service (only one is currently flying) have the same business seating as I review below but do have a First Class cabin. I wrote about the impressive Al Mourjan lounge in this article. 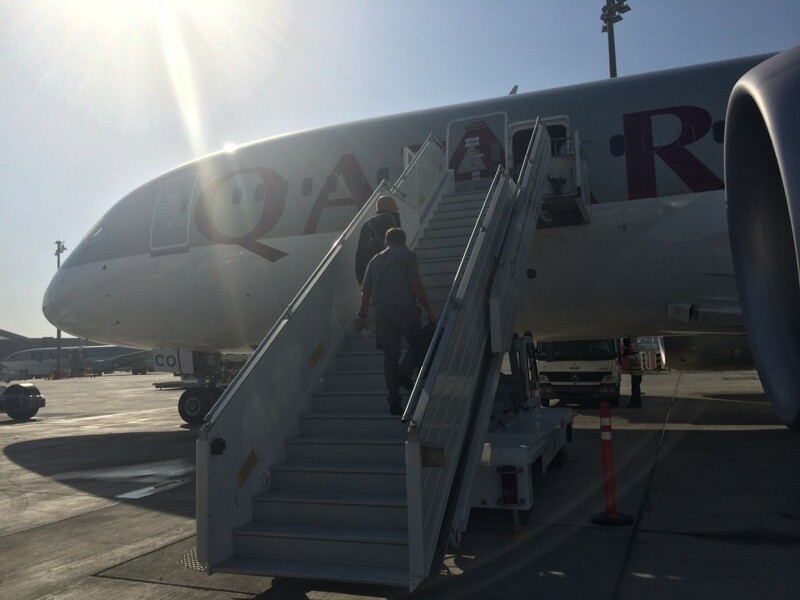 Unfortunately, with the new Hamad International airport still not entirely finished, we had to be bussed to our gate – a pretty sweaty experience as I was dressed for London rather than Doha weather. 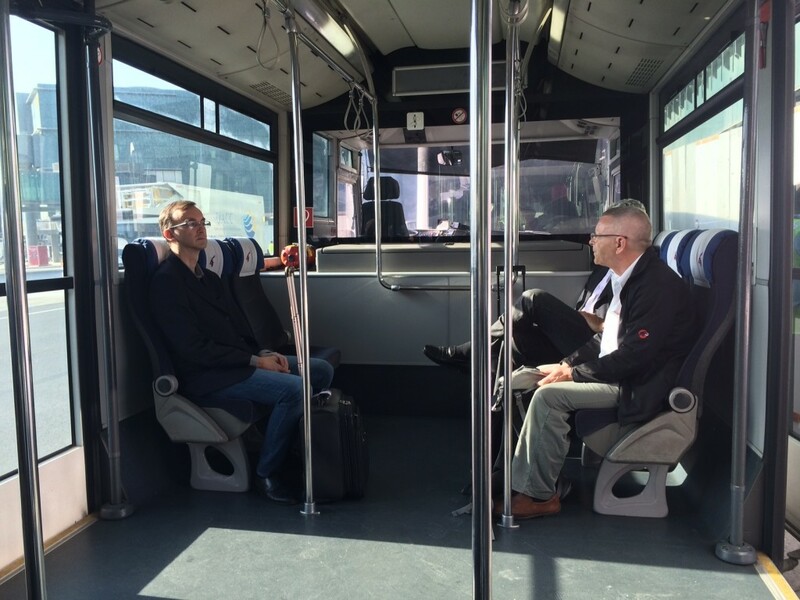 Business class passengers had their own bus. One upside of this was the ability to see the Boeing 787-8 aircraft close up from the outside. The Boeing 787-8 aircraft and the new A380’s contain the very latest version of the Qatar Airways business class seating. It is very, very good if you are a solo traveller, as the layout is 1-2-1. The Boeing 777 fleet is laid out 2-2-2 so you will always have a seatmate. You can read more about this in my earlier review. There is always a trade-off, of course, and the trade-off here is that the seats have an angled herringbone layout. This allows for a similar number of seats whilst switching from 2-2-2 to 1-2-1. I had a solo window seat. 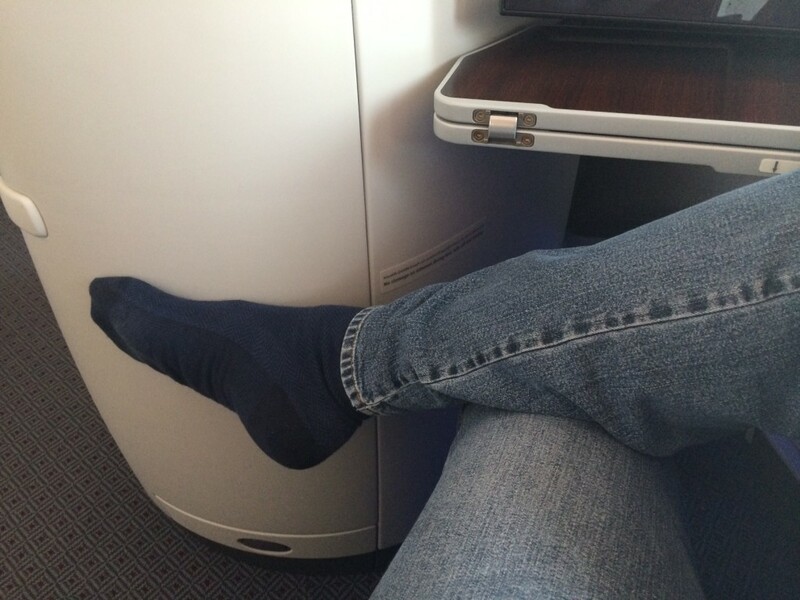 As you can see, the seat is far closer to British Airways First Class than British Airways Club World. You certainly have less personal space than BA First but it is light years ahead of the offering in Club World if you travelling on your own. At some point British Airways has to bite the bullet on its Club World seating. Qatar is just one of a number of airlines now offering a 1-2-1 layout where every travellers gets direct aisle access and solo travellers can have their own private space. Because of the herringbone layout, your feet slot into the corner by the window and – when the seat is flat – you are facing towards the window. The seat was comfortable and easy to operate and I adjusted quickly to slotting my legs into the corner space. The toiletry bag was the same Ferragamo one as my outbound flight. You can photos of the bag and its contents in the earlier review. It is worth noting that the new A380 services have an Armani amenity kit in business class. My review of my 777 outbound flight gives you a good overview of the Qatar lunch and dinner dining options. My return flight departed Doha at 8.40am. 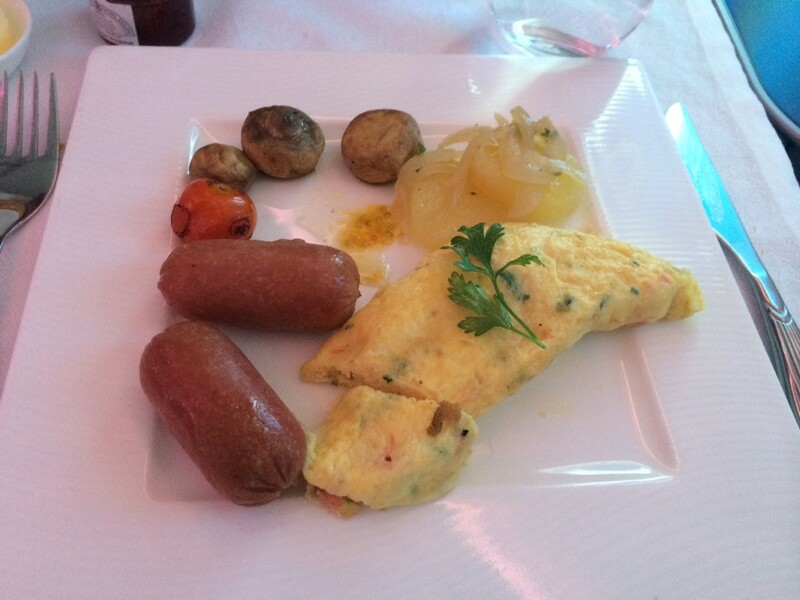 Qatar was offering a breakfast service which, of course, gives them less scope to show that they can do. I went for the fruit and, as you can see below, the omelette. It actually tasted like an omelette. If you have ever tried airline egg before you will realise what a groundbreaking statement that is! There are lighter options of a Summer green vegetable and mozzarella salad or artichoke filled pasta with cherry tomato and basis sauce. Laduree desserts and a cheese selection were also available. Apart from a slightly soggy croissant, the food was excellent. I covered the Oryx IFE system in my 777 review. 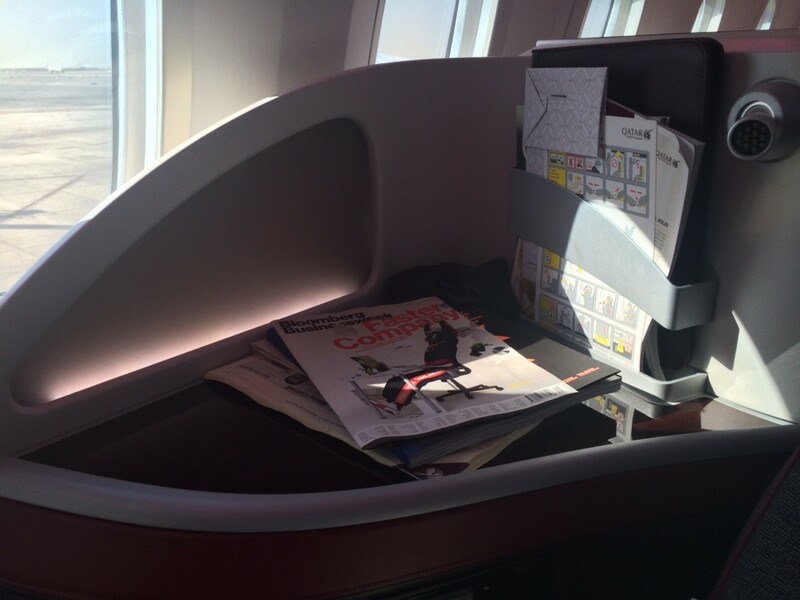 The 787 features the same (huge) range of content and also benefits from a touch-screen remote control. There was also in-flight Wi-Fi. This was not free but did work well when I signed up and gave it a go. Despite visiting fairly low-graphic sites, though, my $10 credit was worked through in around 15 minutes. 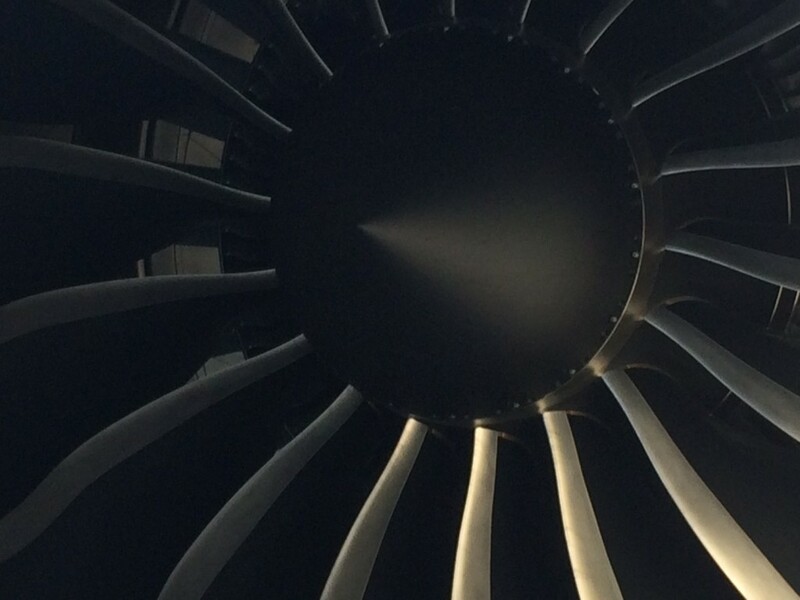 If you wanted to work for the entire flight it would be expensive. 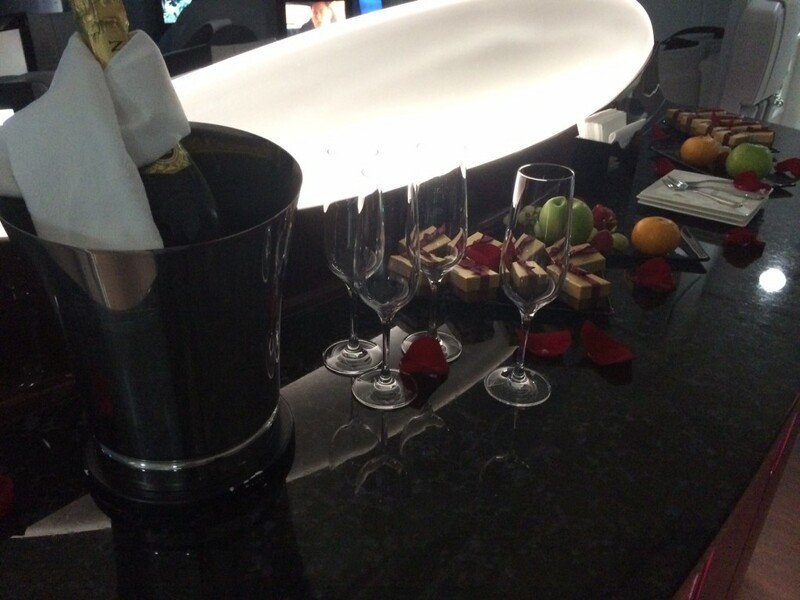 Interestingly, according to the Business Traveller review of the A380 business class service, the wi-fi prices on that aircraft are substantially cheaper at US$10 for three hours. I should mention the windows, as Boeing has made a big noise about the fact that the 787 windows are bigger than a standard long-haul plane. Whilst this is true, it does not jump out at you – they are not so much bigger. Just over five and a half hours later I landed in Zurich. I was very quickly off the plane and immigration was a breeze. My overall experience of Qatar Airways was very impressive and they represent an excellent addition to the oneworld alliance. If you get the opportunity to try them for a cash flight or an Avios redemption (and availability is generally pretty good) then you should. The Premium Lounge in Terminal 4 at Heathrow is excellent and their commitment to food in business class is well ahead of BA. The Oyrx in-flight entertainment system is also a world away from what BA can offer, as I found out painfully when we flew to Dubai in Club World last week. 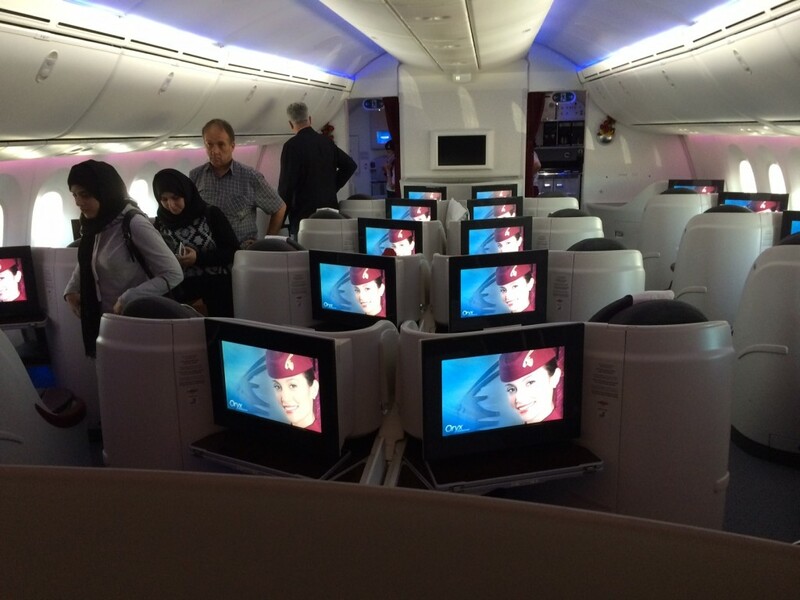 Qatar and Emirates both put the BA system with its limited range of product to shame. For a solo traveller, the ability to fly Qatar in business class on a 787 or A380 and get a solo seat is a genuine advantage. The downside, of course, is that a flight on Qatar Airways will involve a change of plane in Doha which breaks up your journey. If you live in London that may be a concern. If you live in the regions (Qatar flies from Manchester and Edinburgh, the latter having a 787 service) flying from your local airport to the Middle East and changing is probably less painful than changing planes at Heathrow. The only one of the ‘big three’ Middle Eastern airlines I have yet to experience is Etihad. I am hoping to give them a go early in the New Year and to see how they compare with Qatar, Emirates and of course British Airways. If you want to find out more about the Qatar 787 service, there is a special Dreamliner page on the Qatar website here. I really like the middle seats on BA when I am travelling with Mrs BBA (and much prefer it to sitting opposite each other). The other QR aircraft have two seats side by side in business (which we took to KUL earlier in the year) – and that works fine too. So how does this 1-2-1 configuration work for a couple? Good question. Your heads are still close together to talk but your legs are pointing in opposite directions. The angle is not that extreme though. How would this work with a kid? 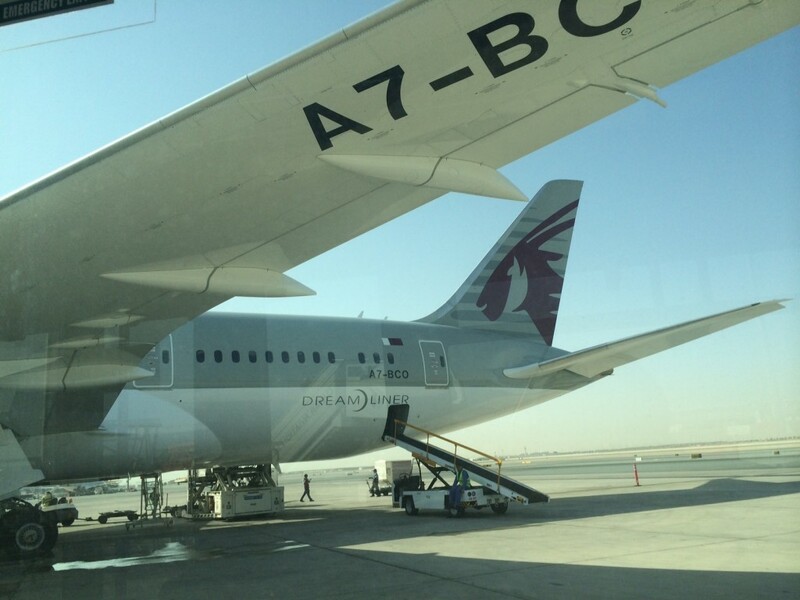 Have a trip soon with our 5yr old and choice between qr787 or angle flat seats. For bulkhead centre pair, is it possible to step across to the other seat or is there a wall in n the way like the other centre seats? For easy access to a kid the older seat layout is more convenient but I would want fully flat for an overnight leg. Good question and I honestly didn’t notice, sorry. It irks me somewhat that I don’t have control over my window for most of the flight. 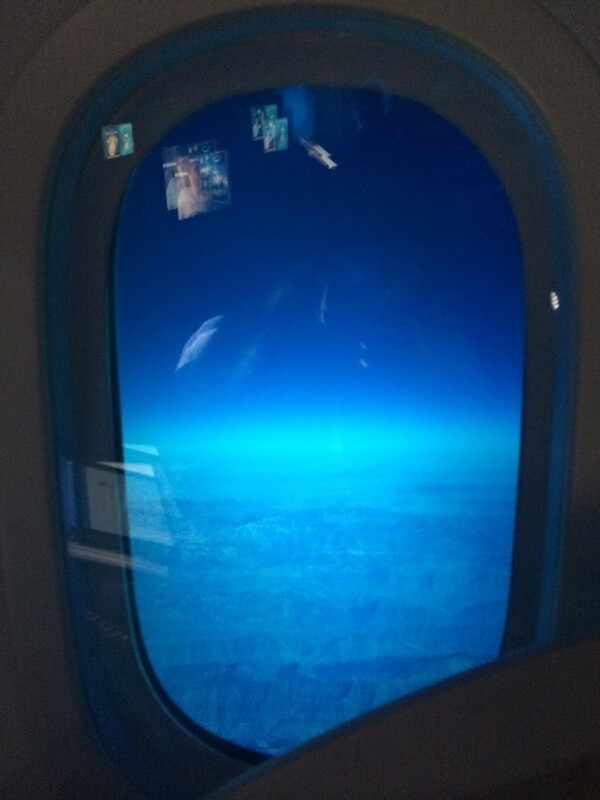 I love looking out the window AND have small kids – I guess I should avoid J and F flights in the future! Just a shame Qatar can’t seem to decide on which aircraft they are deploying and when. I was booked to travel on the A380, but they’ve just cancelled the 2nd daily LHR>DOH service, so I’m stuck on an old A340 without the fancy 1-2-1 seating. As I put in my review, I was booked on 787 to London and had to go to Zurich in the end. I was meant to be on an A380 when we first started planning it!